There are no Classes on Bank Holidays. Time for all of us to take some time out (instructors included) and have some family time. Time out is often as important as working and working out! Just be sure to try do something active and fun on your Bank Holiday off! As a 6 week member, you are free to go along to other locations on other mornings. This will help make up for missing the bank holiday, or even help you get in another workout. 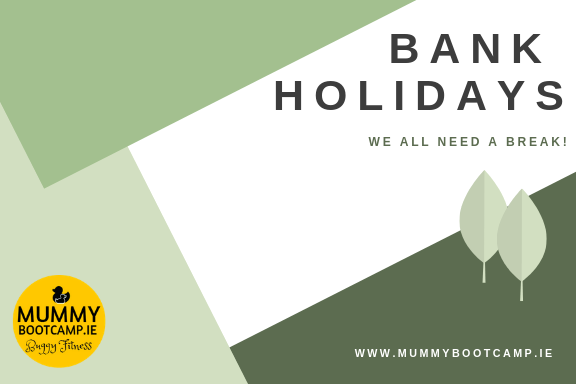 I know some mums tend to do 3 classes on the week leading up to the bank holiday, and again the week after, so that might be a good way of getting in an extra work out too! Don’t forget your Saturday classes too which are on on the Bank Holiday weekends. Click here for details on the Saturday classes. We cannot extend memberships in lieu of the Bank holidays, so please bear that in mind when booking.